There are a number of sleep apnea supplies on the market today that can be relied on to relieve this condition. Therefore, if you're one of the over twelve million Americans affected by sleep apnea, you can "rest assured" that your condition can be controlled. Sleep apnea refers to a condition, during sleep, where breathing is interrupted for as much as 20 seconds at a time and up to 30 times an hour over the course of a night. Normally, a blocked airway is the reason for the ailment or, in rarer cases, an anomaly in the brain is the cause. As a result, left untreated, the disorder can lead to serious health issues, such as stroke or a heart attack. It’s good to know, then, that one can find a certain amount of relief in the number of sleep apnea supplies that are available for treatment of the disorder. Useful in most cases for Obstructive Sleep Apnea (OSA), or the most common form of the disorder, a Continuous Positive Airway Pressure (CPAP) machine is one of the more popular choices among the varied selection of sleep apnea supplies. The breathing aid uses a compressor that pumps air to the user at a continual amount of pressure. Headgear and a nasal mask are used that necessitate covering one’s respective air passages, or mouth and nose. Sometimes, use of a humidifier is required as the mucus membranes of the patient can dry out, thereby causing discomfort. A Variable Positive Airway Pressure (or VPAP) piece of equipment is one of the sleep apnea supplies that offers relief for apnea as well as other respiratory illnesses. Also known as a BiPAP, the machine can be furnished with a humidifier. At the top of the line among sleep apnea supplies is the breathing apparatus known as the Automatic Positive Airway Pressure (APAP) machine. This machine, which can be equipped with a humidifier as well provides continuous scrutinization of a person’s breathing, making the proper adjustments automatically with respect to air pressure. Naturally, when using breathing devices, it’s necessary to employ the requisite auxiliary equipment as well. These sleep apnea supplies normally include head gear, nasal mask, and humidifier. The nasal mask, of course, delivers the pressurized air to the recipient while the humidifier modulates the level of moisture. 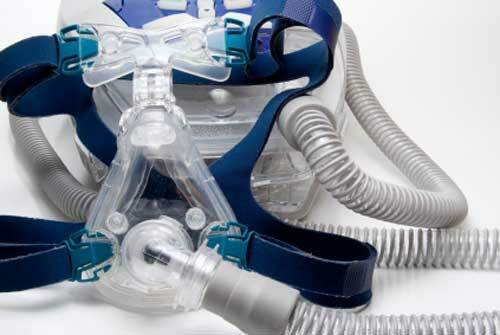 Any of the aforementioned apnea supplies are of vital benefit in the treatment of sleep apnea. They can restore the health to those who suffer from the headaches, irritability, drowsiness, and snoring that sleep apnea imposes on its sufferers. Therefore, this equipment offers an effective cure for sleep apnea and its impact on overall health. People who use sleep apnea supplies, such as breathing machines, to treat their condition report feeling more energized with regard to their daily activities. In addition, their spouses get a better night’s sleep because the patient has also stopped snoring. You too can benefit from the use of any of the above-stated supplies if you’ve been diagnosed as having sleep apnea or suspect that you may have it. Signs of sleep apnea include snoring (the primary sign), profuse sleepiness in the waking hours, and a headache upon waking in the morning. Additionally, you’re at risk for apneic events if you’re over 40, male, overweight, and drink, smoke or use drugs. Having such conditions as hypothyroidism or a neuromuscular disorder can also contribute to apnea. Using any of the machines from among the sleep apnea supplies offered, and using them on a regular basis, can eliminate a host of health problems as well as prevent future problems from occurring. You owe it to yourself, if you suffer from sleep apnea, to review your options. By doing so, you can greatly improve your quality of life now and for many years to come.